New Hampshire was once a hotbed of abolitionist activity. But the state had its struggles with slavery, with Portsmouth serving as a slave-trade hub for New England. Abolitionists such as William Lloyd Garrison, Nathaniel Peabody Rogers and Stephen Symonds Foster helped create a statewide antislavery movement. Abolitionists and freed slaves assisted in transporting escapees to freedom via the Underground Railroad. 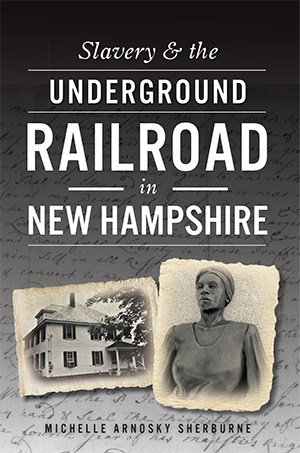 Author Michelle Arnosky Sherburne uncovers the truth about slavery, the Underground Railroad and the abolitionist movement in New Hampshire. Michelle Arnosky Sherburne is the author of award-winning A Vermont Hill Town in the Civil War: Peacham's Story and has volunteered with Peacham Historical Association. She published Abolition and the Underground Railroad in Vermont as her first solo book with The History Press in 2013. She followed that in 2014 with St. Albans Raid: Confederate Attack on Vermont, which premiered at St. Albans' 150th celebration of the raid.